For 31 years, the Peking Acrobats have redefined audience perceptions of Chinese acrobatics. They perform daring maneuvers atop a precarious pagoda of chairs and show their prowess in trick-cycling, tumbling, juggling and gymnastics. "Nearly everything the Peking Acrobats did last night was amazing - and stunning, and breathtaking and WOW!," writes The Seattle Times. Peking Acrobats push the limits of human ability, defying gravity with amazing displays of contortion, flexibility and control. They are often accompanied by live musicians who skillfully play traditional Chinese instruments; the time-honored Chinese music coalesces with high-tech special effects and awe-inspiring acrobatic feats, creating an exuberant entertainment event with the festive pageantry of a Chinese carnival. 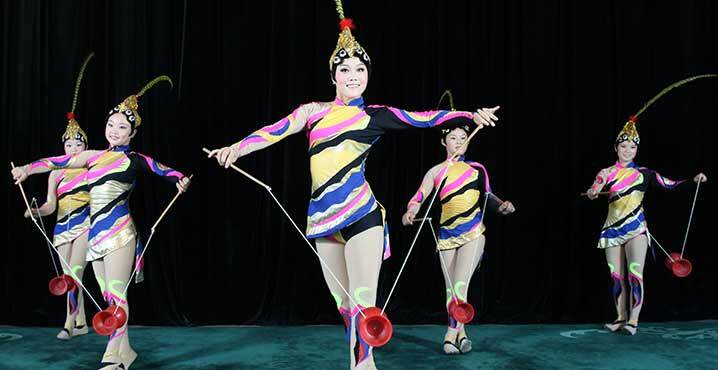 Peking Acrobats have achieved acclaim, dazzling audiences around the world. In city after city, they take the stage before sold-out crowds and reviews are filled with accolades for their superb performances. In the words of The New York Post, "The Peking Acrobats [are] pushing the envelope of human possibility,"combining agility and grace in remarkable feats of "pure artistry."